www.Sarsen.org: A Cats Brain type monument near Stonehenge? The Archaeology report from the Highways Agency reveals this new "Early Neolithic long barrow" to the south of the A303 - but to me it seems to be very similar to Cats Brain recently excavated by Jim Leary. Some snippets from the report - highlighting by me, full details are in the report. 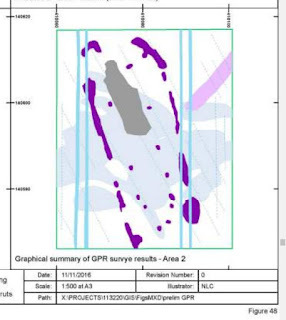 The barrow located towards the south-west of SW2 (Barrow 2) had been identified by recent geophysical survey undertaken by Wessex Archaeology. .. No firm evidence for a surviving in situ internal mound, underlying mortuary deposits or buried soils were identified .. during the evaluation. Barrow 2 has evidence for the existence of either a free-standing timber structure or a post-revetted mound. The former could be part of a façade as at this stage its true extent is unknown. .. there was evidence that (the ditches) of Barrow 2 had been deliberately and rapidly infilled. A fragment of a chalk fossil (possibly an urchin) was recovered from western ditch (slot 9334) of long Barrow 2; although not worked it could conceivably have been retained as a curio. Another fragments of chalk was recovered from cremation grave 512 (associated with the small penannular ditched monument). It is a small sub-square fragment (approximately 500 by 400 by 200 mm) with converging and parallel striations on one of the larger flat surfaces which may be cut marks. irregular side, and was excavated to a depth of 1 m below the surface of the natural chalk without the base being reached. The unexcavated fills were hand augered to try to establish the depth of the ditch without the need to widen the trench and step the section and thus cause unnecessary damage; the augering suggested a total depth of 1.2 m.
No features were recorded in the interior of the monument, between the two ditches. 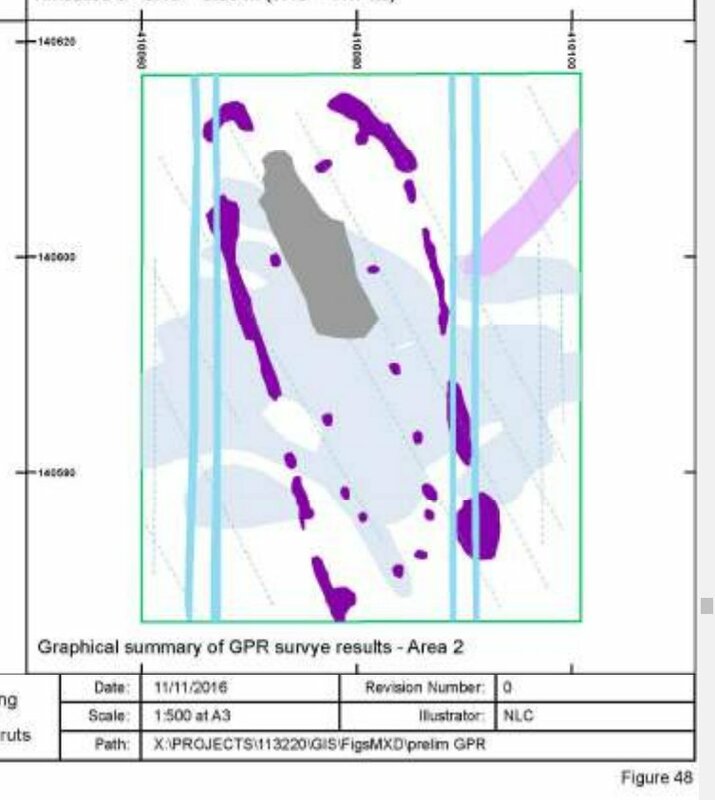 However, there are hints from the GPR survey of possible postholes flanking the position of the mound. No traces of a barrow mound survived within the evaluation trenches. However, the slight doming of the surface of the chalk, and presence of more degraded natural between the ditches probably results from the partial protection of the chalk from ploughing by the presence of the former mound. It is possible that the dark soil layers noted in the ditch section derive from the barrow mound.